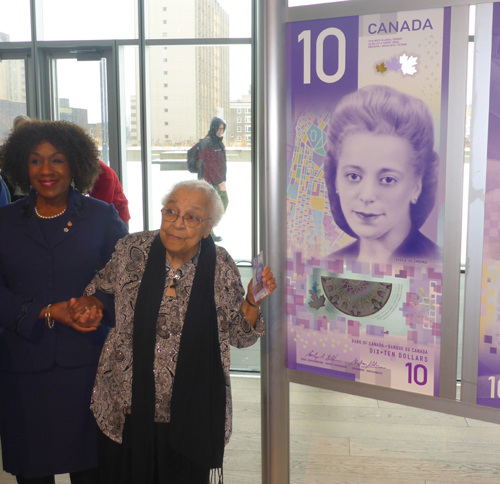 On International Women's Day 2018, a new $10 bill celebrating civil rights activist Viola Desmond was unveiled in Halifax. Wanda Robson, sister of Viola Desmond, uncovered the bank note with the help of Finance Minister Bill Morneau and Bank of Canada Governor Stephen Poloz. For the first time in Canadian history, a Canadian woman is being honoured on the face of a regularly circulating Bank of Canada note. The unveiling of the note was the culmination of the work of activist Merna Forster and tens of thousands of Canadians who supported her campaign to celebrate women from Canadian history on bank notes. 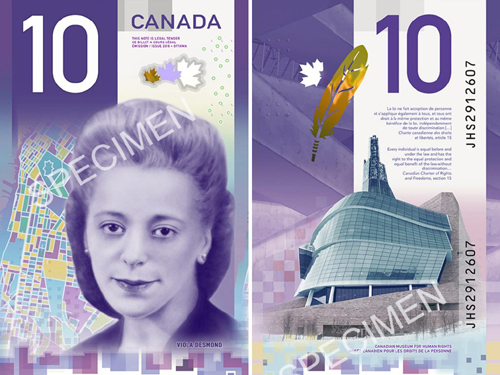 In July 2013, historian and author Merna Forster began a petition on change.org calling on the Bank of Canada and the Minister of Finance (who approves bank note designs) to celebrate female Canadian historical figures on Canadian bank notes. Wanda Robson with bank note celebrating her sister Viola Desmond (Photo by Merna Forster). Money Makeover: Canadian Women on Bank Notes, article by Merna Forster in Canadian Issues, published by the Association for Canadian Studies. The Senate of Canada has passed a bill that will make O Canada, our national anthem, gender neutral. The words "in all thy sons command" will be replaced by "in all of us command." In 2016, the House of Commons passed a private member's bill calling for the change. The bill was introduced by Liberal MP Mauril Bélanger. For more than thirty years, various efforts were undertaken to change the national anthem and make it gender neutral. The bill will become law once the Governor General gives royal assent. Copyright © 2004-2018 Merna M. Forster. All rights reserved.